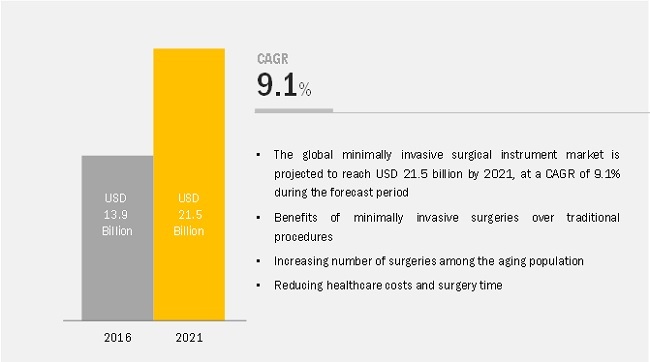 The minimally invasive surgical instruments market is projected to reach USD 21.47 Billion by 2021 from USD 13.89 Billion in 2016, at a CAGR of 9.1%. The major drivers for the market include the benefits of minimally invasive surgeries over traditional open surgeries; reduction in healthcare costs and time; increasing number of surgeries among the aging population; increasing prevalence of lifestyle disorders; and technological advancements. In this report, the global minimally invasive surgical instruments market is segmented based on product, application, end user, and region. By product, the market includes handheld instruments, electrosurgical instruments, inflation systems, guiding devices, auxiliary instruments, and cutter instruments. Based on application, the market is segmented into cardiothoracic surgery, cosmetic surgery/bariatric surgery, gastrointestinal surgery, orthopedic surgery, gynecological surgery, vascular surgery, urological surgery, and others. The others segments includes ENT/respiratory surgery, neurological surgery, dental surgery, and pediatric surgery. Based on the end users, the market is divided into government hospitals, private hospitals and surgical clinics, and academic and research institutes. A combination of bottom-up and top-down approaches was used to calculate the market sizes and growth rates of the global minimally invasive surgical instruments market and its subsegments. All percentage shares, splits, and breakdowns were determined using secondary sources and verified through primary sources. All possible parameters that affect the markets covered in this research study have been accounted for, viewed in extensive detail, verified through primary research, and analyzed to get the final quantitative and qualitative data. Primary interviews with key opinion leaders were also used to determine the percentage shares of each subsegment and the relative differences in growth rates. The report provides qualitative insights about growth rates, and market drivers for all subsegments. It maps market sizes and growth rates for each subsegment and identifies segments poised for rapid growth in each geographic segment. The minimally invasive surgical instruments market is projected to reach USD 21.5 billion by 2021 from USD 13.9 billion in 2016, at a CAGR of 9.1%. Benefits of minimally invasive surgeries over traditional open surgeries; reduction in healthcare costs and time; increasing number of surgeries among the aging population; increasing prevalence of lifestyle disorders; and technological advancements are key factors expected to drive the growth of the minimally invasive surgical instruments market. Increasing awareness of technologically advanced MIS instruments & procedures and emerging markets provide significant growth opportunities for the market. This report segments the global minimally invasive surgical instruments market by product, application, end user, and region. The global minimally invasive surgical instruments market, by product, includes handheld instruments, electrosurgical instruments, inflation systems, guiding devices, auxiliary instruments, and cutter instruments. In 2015, the handheld instruments segment accounted for the largest share of the global minimally invasive surgical instruments market. These instruments are convenient to use and are widely implemented in almost all kinds of MIS surgeries; these factors contribute to their largest share in the MIS instruments market. Based on application, the market is segmented into cardiothoracic surgery, cosmetic surgery/bariatric surgery, gastrointestinal surgery, orthopedic surgery, gynecological surgery, vascular surgery, urological surgery, and others. The others segment is further segmented into ENT/respiratory surgery, neurological surgery, dental surgery, and pediatric surgery. In 2015, the cardiothoracic surgery segment accounted for the largest share of the global minimally invasive surgical instruments market. The rising prevalence of cardiac diseases in developed as well as developing countries, increasing demand of minimally invasive surgeries, growth in aging population, and technological developments are the major factors driving the growth of the MIS instruments market for cardiothoracic surgeries. The geographic segments included in this report are North America, Europe, Asia-Pacific, and the Rest of the World (RoW). North America is further segmented into the U.S. and Canada. 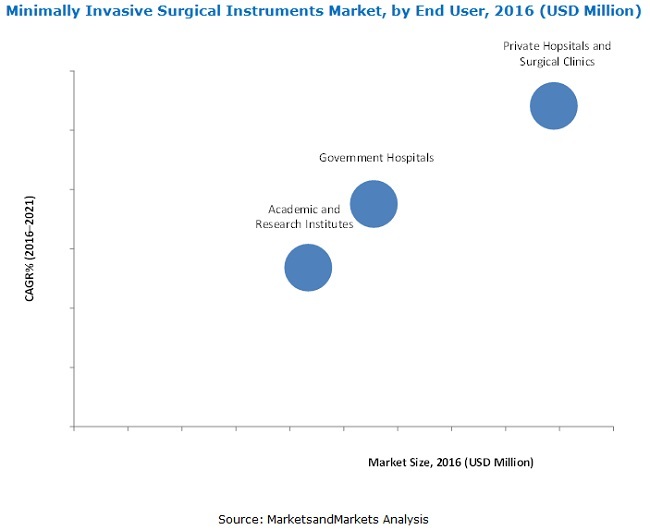 In 2015, North America accounted for the largest share of the global minimally invasive surgical instruments market primarily due to the rising number of surgical procedures, growing government investments, growing geriatric population, and rising prevalence of lifestyle diseases in this region. With the rising geriatric population, presence of a large patient pool undergoing surgical treatments, growing awareness about modern surgical instruments and techniques, and implementation of various initiatives to reduce the rising healthcare expenditure in Asia-Pacific, the demand for minimally invasive surgical instruments in this region is expected to grow, which in turn will compel the key players to expand their geographical presence in this region. 11.11 Zimmer Biomet Holdings, Inc. Figure 81 Company Snapshot: Zimmer Biomet Holding Inc.